I've been baking so much lately and that's great! I love the creative process and baking these two cakes was a terrific way to spend the afternoon. The market had amazing fresh fruit and the berries were sooo appealing. And! the currants were equally appetizing. Vanilla is simply a perfect platform to show off this deliciousness. 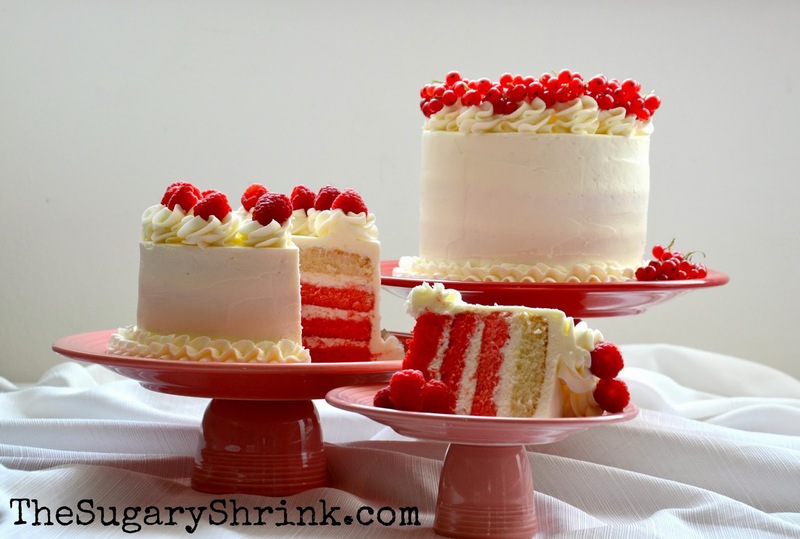 I was thinking a red ombré layer cake would highlight the color of the berries. Very carefully, the batter was separated into four equal portions. Hot tip: I used four identical bowls and weighed each bowl with the batter in it to within 10gr of each other. Then added the coloring gel. As soon as the pans were pulled out of the oven, I realized I should have used 8" rounds and not the 6" rounds - the cake would be too tall to serve. 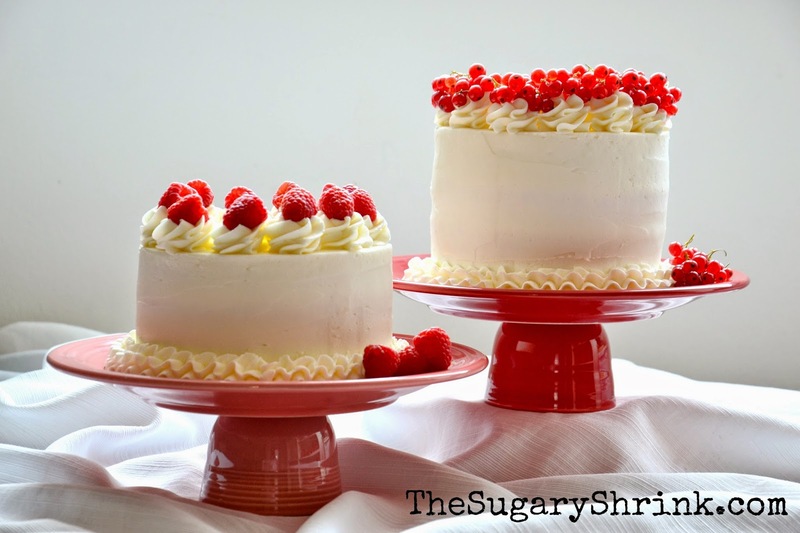 Using my Wilton cake leveler, I split each round and suddenly had two cakes to fill, crumb coat, and decorate! Ok. That'll work. is on a Fiestaware dinner plate in Flamingo. The luncheon plate is to deep in the center. As it turned out, I didn't split each round at the mid-line so one cake turned out slightly taller than the other. If I have to do this again, I will pull out my kitchen ruler (which happens to be the same device I use in quilting as a measuring square/straight edge). With the weather warming up, my schedule will have to change with baking at night and buttercream early in the morning. Baking in the afternoon seemed like a luxury (no a/c in our apartment). Working with red is great fun...working with fresh fruit that is red is even more fun! Today seemed like a good day to keep things simple and clean. The sweetness of the raspberries are delicious. The tanginess of the fresh currants is such a surprise - it's a great combination with the buttercream. If I was disappointed with any part of this cake, it was the red ombré. There is good contrast between the lightest red layer and the darkest...but the middle layer gets lost. I'm going to let myself off the hook for this one and be more careful with the gel when baking an ombré again. Living in the solution is far more satisfying that living in the problem. I'm grateful for my life partner, our people, and sobriety. And, they like cake.